Tony Phalen goes Back to Back at the 2010 SCT Nationals! Tony Phalen wins the 2010 Short Course Nationals! Tony once again takes a National Title at the 2010 Short Course Nats held in Enfield CT and R/C Madness raceway. Back to Back Tony…Great Job! 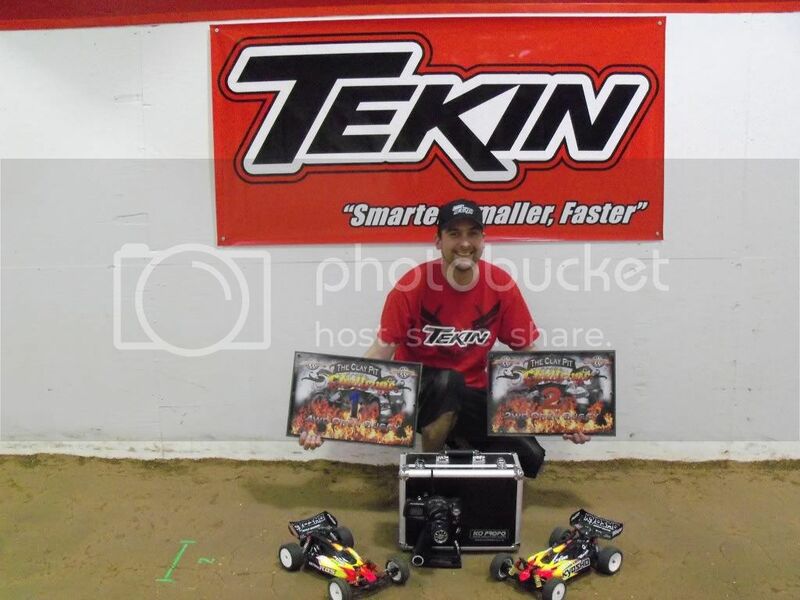 Tony drove his Tekin Powered SC8e to victory lane using the Tekin Rx8 and T8 motor. Chris Sturdy Dominates the Queensland Champs! Chris Sturdy dominated the Queensland Champs Tq’ing and winnng every 17.5 class! Great Job Chris!!! Tekin wins big at the 2010 Alabama Manufacturers Shootout!! Team Drivers Jeremy Potter and Randy Pike were in attendance to offer support, and race of course! Both Jeremy and Randy were running Electric 1/8 Buggy having solid qualifying and making the A-Main. Randy also entered in the hotly contested Electric Truggy taking the Tq and the overall win. Jeremy Potter was armed with a Tekin Rx8 2050 in his Hotbodies Ve8. Randy was running an Rx8 1700 equipped Losi 2.0. In Truggy Randy was running the Rx8 and 2000kv T8 motor. Both were running Thunder Power 4s 40c packs. Both were there to help with driver setups, gearing help and car setup. During all of the mains nearly 30+ Tekin Rx8 systems were running without a single hiccup or failure. The track was in great shape while the Alabama heat made for some great racing on the large indoor track. It was an overall success. Special thanks to Alan Burton and the entire AMS crew for hosting a great event. Jesse Munn Wins the NW Shortcourse Nationals in Pasco, WA !! 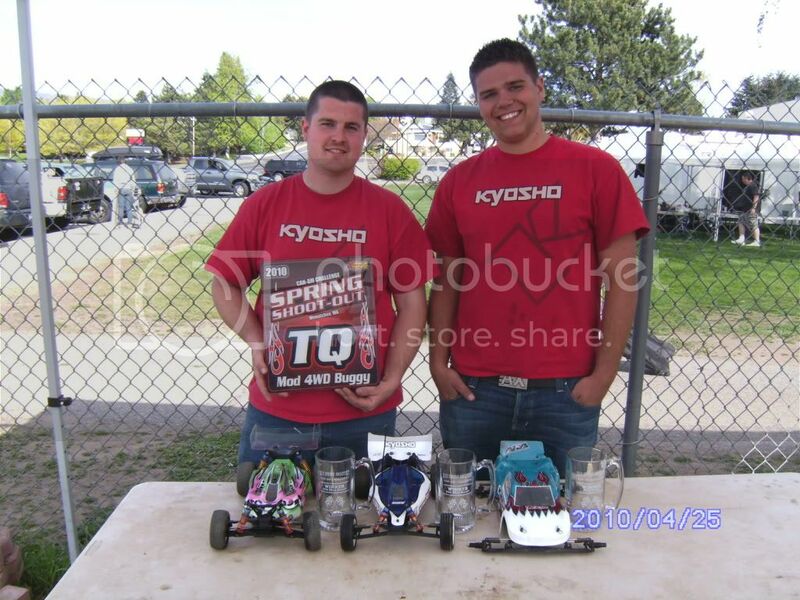 Team Driver Jesse Munn piloted his Tekin/Redline 8.5 powered 2wd Kyosho Ultima SC to victory in Mod Pro 2 SCT. In the 4wd class Jesse also Tq’d and won borrowing a friends 4×4 shortcourse powered by an RS Pro and 7.5 Redline equipped with a 13mm torque rotor. NCT Round 1 is in the books! Round #1 of the Northwest Championship Tour Spring Shootout in Wenatchee, WA is in the books. Jesse Munn qualified 2nd and won Mod 2wd buggy and TQ’d and won Mod 4wd buggy. Brian Munn qualified 4th and won Mod truck. Dave Gullickson TQ’d and won stock truck and qualified and finished 2nd in Mod truck(running a 17.5!). Greg Williams 5th in stock truck, Mike Roth 7th in stock truck and 5th in Mod 4wd. Steven Daniluk qualified 4th and finished 1st in the 15min main. My car was a Kyosho MP9 SE with a Tekin RX8 ESC, Tekin 2050kv motor followed by Mike Roth taking 5th. The First Annual “Clay Pit” Challenge at our track this past weekend. There were over 90+ entries. Ron Atomic managed to TQ both 4wd Mod Buggy and 2wd od Buggy. Ron ran out of tire in the 2wd buggy A1 main to finish second. A2 buggy main did not go as planned as Ron once again had a tough main choosing the wrong tires. In A3 Ron was closer with his tires but had to settle for 2nd overall as the copetition was feirce. In 4wd things were exciting. A1 started well as Ron held the lead for a bit then started making mental errors and swapping it back and forth with Chris Allison(the shop owner). Chris got the better of Ron through traffic and Ron ended up second in A1. In A2 Ron went from 1st to last as he cased the first triple. Ron managed to fight his way back through the cars to end up second. Luckily for Ron there was a different winner than A1. Going into A3 it was a toss up. There were 4 cars with a chance at the overall title. Chris and Ron swapped the lead a couple of times in the first minute or so, then Ron strapped it up and checked out, setting the fasted time of the weekend and Taking the overall win(decided by a tie break). 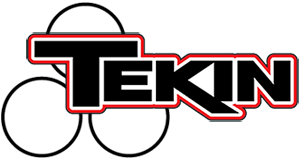 Tekin Goes Huge at the 22nd Annual April Fools Race in Magna Utah! Team Tekin dominated at the 22nd annual April Fools Classic held at IRCR in Magna Utah. Jason Schreffler Tq’s and Wins the hotly contested 13.5 TC Rubber Class at the 2010 Snowbirds! Jason Schreffler Tq’s and wins the 13.5 Rubber TC class at the 2010 Snowbirds!